Jeffrey Welch's Blog: Is Your Dog Peeing a Lot? Should You Worry? The post Is Your Dog Peeing a Lot? Should You Worry? by Melvin Peña appeared first on Dogster. Copying over entire articles infringes on copyright laws. You may not be aware of it, but all of these articles were assigned, contracted and paid for, so they aren’t considered public domain. However, we appreciate that you like the article and would love it if you continued sharing just the first paragraph of an article, then linking out to the rest of the piece on Dogster.com. My dog, Baby, is a healthy and happy Bluetick Coonhound mix. Our daily walks in the forest are constantly interrupted by various calls of nature. Baby is a scenthound, so she has an instinctive need to smell every tree trunk, pile of deer droppings and disturbed patch of pine straw in the forest. When that isn’t halting our progress, it’s her habit of peeing a lot. Between drinks of water before we leave the house and when we reach the turnaround point, she might pee five or six times! Is her bladder the size of a tanker truck? Is my dog peeing a lot and should I be worried? Age may cause frequent urination in dogs. Photography ©Artnature/Thinkstock. Is your dog peeing a lot? How old is he? A dog’s age has a definite impact on the number of times they’ll need to urinate. Whether they’ve just brought a new puppy home or are witnessing the early signs of a dog reaching seniority, first-time dog owners might be alarmed at how prolific or productive their dogs’ bladders are. Every dog is different, but on average, a healthy dog urinates once every four to six hours. Until they are about 5 or 6 months old, puppies tend to urinate twice as often, every two hours or so. Part of that is lack of bladder control, which they master with maturity, house-training and force of habit. Polyuria can return naturally as part of the aging process or as a side effect if they are on certain medications. If a dog spends more time outside during the warmer months of the year, he’ll need more water. Since dogs don’t sweat the way that we do, they regulate their body temperature by increased panting, which uses more of their body’s water stores. Dogs who go inside and outside often may drink more while they’re in the heat, but returning to a climate-controlled space means they’re not losing that extra drinking water to panting. This brings about a cycle where lapping up more water means they’ll have to pee more. Dogs don’t use stickers or magic markers, so a dog peeing a lot is a common way for him to assert a claim to spaces he considers his territory. This practice, called territorial, or urine marking, is the primary reason my own dog pees so often when we’re out walking. How can we tell the difference between a dog just relieving himself and marking? Normal urination happens as a long and sustained stream. Urine marking, on the other hand, occurs in short bursts, and may only be a few drops at a time. The practice makes little difference out in nature, but can be problematic if it’s happening in the house. One way of curtailing dog marking indoors is to have a dog spayed or neutered at the earliest opportunity. Dog owners who have recently adopted a second dog may find themselves in the crosshairs of a temporary urine-marking contest as the two dogs adjust to sharing a common space. Interestingly, while getting a dog fixed can limit his drive to mark territory, the procedure can also lead to cases of incontinence, especially in female dogs. In this context, an incontinent dog pees more often because she lacks bladder control. There is a distinct difference between a dog peeing a lot because she has to or needs to, and one that urinates involuntarily. Does this mean dog owners should think twice about getting their dogs spayed? No! According to Dr. Peter Dobias, the link is not to the surgery, but to how the dog’s back is stretched during the procedure. Indeed, Dr. Dobias says that back injuries to dogs may be a primary reason for loss of bladder control, especially as dogs age. Urinary tract infection, or UTI, in dogs, is a common and treatable reason for dogs to urinate more often than usual. Like incontinence, urinary tract infections affect older female dogs at a much higher rate than male dogs of any age group. As with many serious medical conditions, though, a dog peeing a lot is not the only, nor the most alarming, symptom a pet parent will notice. What is more likely to catch their attention is hazy or blood urine, a dog who squats for an extended period of time before starting to pee, or one who is whining as they urinate. The biggest culprit is bacteria in a dog’s urethra, which can be resolved with a course of antibiotics. Diabetes, specifically diabetes mellitus, in dogs, can also be signaled by a dog peeing a lot. In dogs, this form of diabetes arises when the digestive system cannot effectively convert food into usable energy. Similar to UTI, there are a host of additional symptoms beyond frequent urination. As the disease advances, the symptoms begin to create a feedback loop revolving around consumption and excretion. Low blood sugar means the dog has less energy and feels the need to eat more. In order to void all the additional food sugars they are consuming, the dog will have to drink more water and pee accordingly. Canine diabetes cannot be cured, but it can be managed through a regimen of diet, exercise and medication. The bottom line: Familiarize yourself with your dog’s peeing habits! Frequent urination alone should not be a cause for immediate concern. It may seem like strange advice, but watching your dog pee at every opportunity can be a boon to your dog’s health, especially as he grows older. Familiarize yourself with how, when, where and the number of times your dog urinates. It doesn’t take much practice or observation for a dog owner to learn to differentiate between peeing, marking and involuntary leaking. Make note of dramatic changes in the color of a dog’s pee, as well as any other changes in the dog’s energy level and eating habits. Thumbnail: Photography by Heinz Teh / Shutterstock. 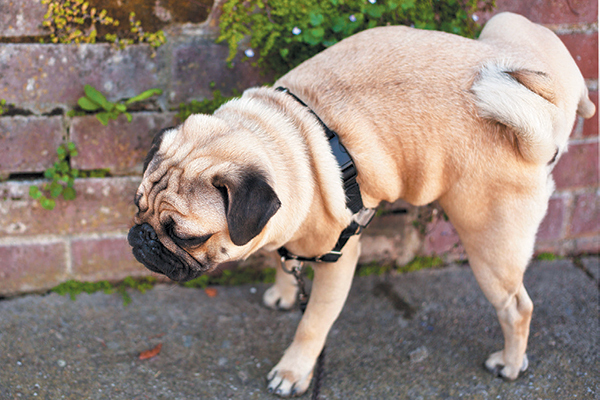 Tell us: Is your dog peeing a lot? How often does your dog pee?